From the luxury condo rental market in Manhattan to townhouses in the oil town of Calgary, cities which not too long ago gave landlords a rental shortage with heavy demand from tenants are seeing the tide turn. Landlords are now having to compete for the tenant, offering gimmicks such as a free month’s rent, gift certificates and other ‘stuff’ just to fill their suites. As a landlord, I don’t think that’s money well spent. In fact, for about the same money you would lose out on by giving away a free first month’s rent, you could take that capital and invest it in your suite, likely charge a little more per month, and beat out the competition simply because your rental property will look much more welcoming and homey for a prospective tenant. 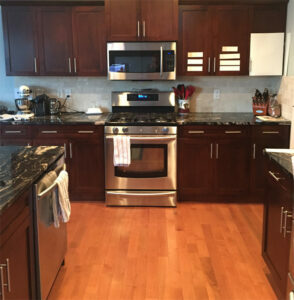 You just have to be on top of what tenants are ‘looking for’ in a rental these days: styles, layouts, appliances and paint colors. As I’ve always said, it’s all about the look and location. And right now, the ‘look’ tenants want is bright and contemporary. Darks are no longer desirable. So if your suite could use a little facelift, I’d start by sprucing up the kitchen. Paint the cabinets a nice bright, clean color. This can make a world of difference from a tenant’s perspective. 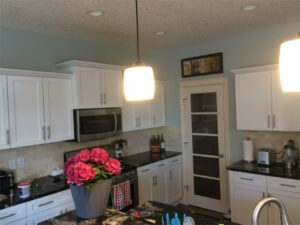 That kitchen cabinet paint job cost about CAD$1,700 – money well spent. If you’re in a tough rental market, don’t try to entice tenants with gimmicks. Invest money into your rental property and offer a better product than your competition. That’s how you avoid missing a month’s rent in competitive rental markets. And it adds value to your investment property. The better your property looks, the higher quality tenant you will get. P.S. Subscribe to my newsletter below to get weekly entrepreneurial and real estate know-how. Only my best content will land in your inbox.